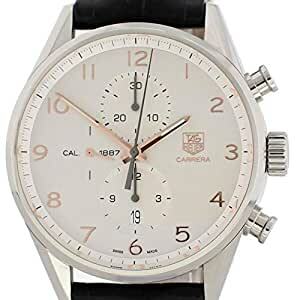 TAG HEUER CARRERA CHRONOGRAPH CAR2012 MENS WATCH. STAINLESS STEEL 44 MM CASE WITH A SMOOTH BEZEL. SILVER DIAL WITH LUMINOUS HANDS AND ARABIC HOUR MARKERS. MINUTE MARKERS AROUND THE OUTER DIAL. DATE DISPLAY AT 6 O’CLOCK. SMALL SECONDS, 30 MINUTE, AND 12-HOUR SUB-DIALS. BLACK ALLIGATOR LEATHER STRAP WITH STAINLESS STEEL DEPLOYMENT BUCKLE. CALIBRE 1887 AUTOMATIC SELF-WINDING MOVEMENT WITH A 50-HOUR POWER RESERVE. TRANSPARENT CASE BACK. SAPPHIRE GLASS. THIS WATCH IS BACKED BY OUR ONE YEAR WARRANTY.. BUY WITH CONFIDENCE KNOWING EACH TIMEPIECE GOES THROUGH THE SAME RIGOROUS 31-POINT INSPECTION. REST ASSURED ONLY AUTHENTIC PARTS STRAIGHT FROM THE MANUFACTURER ARE USED. THE CERTIFIED PRE-OWNED PROGRAM ON AMAZON ENSURES PEACE OF MIND AND TRANSPARENCY VIA STANDARDIZED REPORTS AND A 1 YEAR WARRANTY PROVIDED BY WATCHFACTS.